Since Christmas, a little puppy has been living at the Elysée Palace: her name is Philae. She was given as a present to François Hollande by the federation of French veterans in Montreal. A doggy at the residence of the president, it can only be good for the president’s image; since Pompidou, forty years ago, every president has owned his own four-legged friend. Philae arrived straight from Quebec on 25th December, she is a beautiful three-month-old black Labrador. The President chose her name as a wink to the little spacecraft which successfully landed on the Tchouri comet, on 12 November. At the palace, the landing went well for the little dog who is for now firmly staying on the ground floor. Many dogs have resided at the Elysée. Nicolas Sarkozy had three: Dumbledore, Clara and Toumi. Three little terrors, considering they left teeth marks on the legs on many chairs in the palace, causing more than £5.000 worth of damage (Mediapart info). We also recall Sumo, Chirac’s little Maltese dog. In 2007, the small dog did not handle well leaving the presidential residence, to the point of becoming aggressive – biting the former president! France followed the whole post-Elysée depression of Sumo. The Chiracs eventually had to separate themselves from him. Before that, there was Baltique, Mitterrand’s loyal black Labrador, who was regularly seen on the president’s official pictures. 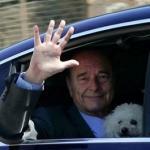 Giscard had Samba, with whom he used to pose for Paris Match; and finally Pompidou had Jupiter… It would seem that a dog is a real political animal. And not only in France! In the UK, the Queen’s Corgis are as famous as the Crown jewels. Since 1933, the Royal Family has made this type of dog its preferred pet. 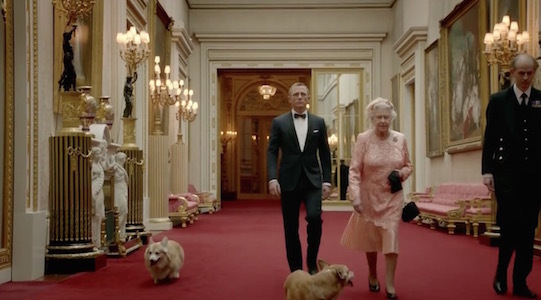 Monty, one of Elizabeth II’s favourites, even got the chance to have a cameo role alongside James Bond and Her Majesty in the Olympics opening video, lucky him! The Royal Family is really into dogs, and some of these doggies are sometimes quite hard to handle. This is why Lupo, Kate and William’s cocker spaniel was banned from the Royal’s festive Christmas celebrations last year at Sandringham, because of what had happened before; in 2013, one of the Queen’s beloved dogs almost lost one of his ears because of Max, Princess Beatrice’s dog who attacked him. And in 2003, another corgi was assaulted by Florence, Princess Anne’s Bull Terrier, and later put down. Philae, stay safe in France with daddy!